Have you ever needed to know what the future will look like? To create great strategic plans, our clients need to understand what their operating environment will look like in five, ten, or thirty years. They want to know how the population, jobs, markets, homes, and infrastructure are expected to change. We help these clients by providing reliable projections, often through analysis of preexisting data. Although we have no crystal ball that tells us exactly what the future holds, we can point clients in the right direction. 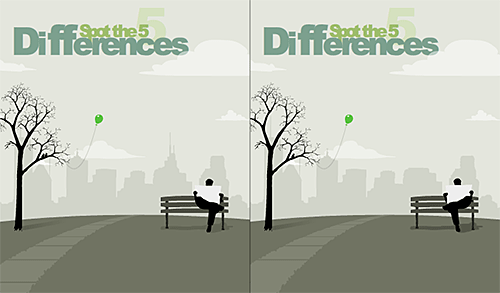 Here are a few ways we look at trends and projections to help solve our client’s problems. We frequently commence research projects by reviewing the current population profile and looking for patterns from the past that show how we got here. A common way we do this is by mining demographic data from the U.S. Census. We access tons of demographic estimates across a wide variety of geographies, such as zip codes, census tracts, towns, cities, counties, metro areas…you get the idea. The amount of demographic information available is amazing. While examining demographics is a cost-effective way to start to understand an area or population, there are critical limitation to demographics. Data are a year or two years old by the time they are available to the public. More importantly, there is a problem assuming the future will represent the past. Demographics can get us started, but when we want to peer into the future, we move to other sources. Several data sources project key variables such as population, jobs, age profiles, homes, and transportation. A good source for population projections in Colorado is the State Demography Office. From this website, we can align previously collected population data with future projections to provide a nice continuation from past, to current, to future population trends. Further, we can break apart the population trend with age profiles that show changes by generation. We can create such analyses at the state or county levels or any region comprised of counties. For example, below is the population of the Denver Metropolitan Statistical Area (MSA), which is comprised of ten counties (Adams, Arapahoe, Broomfield, Clear Creek, Denver, Douglas, Elbert, Gilpin, Jefferson, and Park). 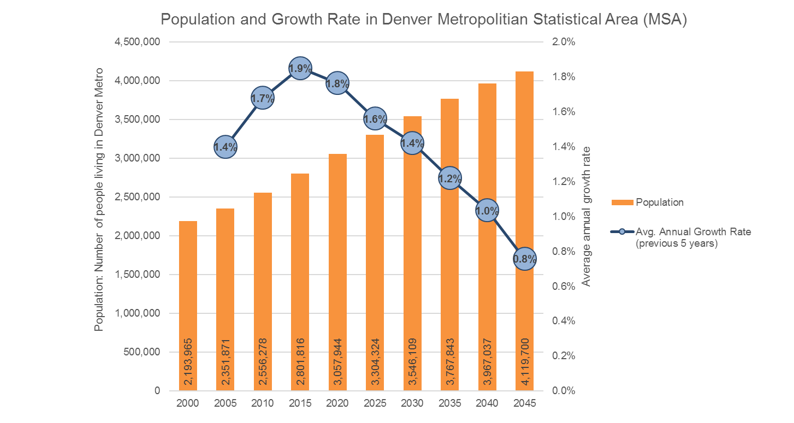 You can see the rate of growth in Denver Metro is projected to steadily slow, although remain positive, from 2015 to 2050. Sometimes our clients are more interested in understanding the future of job growth, including how many jobs are expected, what type of jobs, and where they will be located. We use a few different sources to answer these questions. If we are working in Colorado, we pull down job forecasts by county or region. 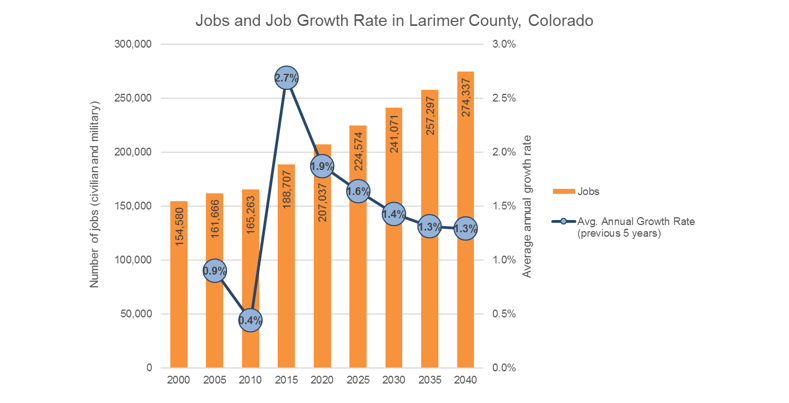 For example, here is the forecast for total jobs and job growth rate for Larimer County, Colorado. Other times, our clients would like more detail than total jobs. We pull occupation forecast data from the Colorado Department of Labor and Employment. This website provides current and projected occupations by various geographies including counties and metro areas. For example, a law school marketing department might be interested in projections of the number of lawyers working in various areas in Colorado. The following table shows that the growth rate of lawyers is expected to be slightly higher in Denver-Aurora Metropolitan Area than in Boulder or Colorado Springs. These are just a few examples of how we have helped our clients look at the past as well as understand what the future might look like. Of course, many clients have questions that are not so easily answered by secondary data that is already available. In these cases, we build our own models to measure and predict all sorts of estimates, such as demand for child care, business relocation, and commuting patterns. If you need to understand what the future might bring to your organization, give us a call and we will see how Corona can help solve your problem. I’ve been struck recently by my clients’ desires to simultaneously sail and drop anchor. By sailing I’m referring to the opportunity to advance, grow and change, strategically of course. To move towards the horizon. Counterbalancing that vision is an anchoring in the past – where we’ve been – as well as the here and now – both who we are and what we believe in. In some cases this desire for change and continuity is required to achieve consensus on future direction. Whether organizations are still reeling from the recession’s perma-shifts (e.g., declining market demand, slow economic growth, and downsized operations trying to do more with less) or reminding themselves that they really, truly have been successful, there is a shift to what I call the pragmatic visionary. It is more difficult to navigate changing currents when too firmly anchored. Pragmatic visionaries understand the realities of today – and embrace them – while making a case for what is possible three to five years from now. We can hoist the anchor a bit more readily when we remind ourselves that our planning horizon is longer than 12-18 months. A three- to five-year plan provides span – a larger sail of sorts – to carry us forward. Point your sails pragmatic visionaries. Team Corona is here to lend its compass and binoculars. Surveys can be used to guide a plethora of business decisions. If you’re considering launching a new product or service, a survey can help you get feedback on not only the product or service itself, but your messaging and collaterals as well. If you’re looking to grow into a new market, a survey can help you understand the lay of the land so that you can maximize the return on your marketing investments. Or maybe you just haven’t checked in with your customers in a while and want to know how they feel; a survey can be an effective tool for that as well. However, as any good strategic planner will tell you, businesses looking to grow and develop long-term sustainability need to set their sights higher and focus on the long-term goals of their organizations, as well as the strategies and tactics that it will take to get there. In these situations, an ongoing brand tracking survey can be a very effective tool to help guide an organization’s decisions as it grows. Using a one-time survey, you can effectively quantify how your brand is perming in all of these measures and, if necessary, take actions to improve your brand’s position. For example, if awareness is low but other metrics are high, you may want to focus your marketing efforts on just getting your name out there. If awareness is high, but favorability is low, it may be worth looking at your product and making sure it’s living up to your brand promise. And if you’re missing the mark on key aspects of your brand that you are trying to convey in your marketing messages, it may be worth re-evaluating your advertising and collaterals to make sure they are as effective as you’d like them to be. A one-time survey can also be effective at understanding how your brand’s performance measures up against some of your key competitors. By using these competitors as benchmarks, you can understand where you’re ahead of the pack and where you could look to improve. The real power in brand tracking surveys, however, lies in plotting how your key performance indicators change over time. If you set a goal of increasing awareness of your brand by 10% after seeing it is low in your initial survey, a tracking survey can serve to see if your efforts are paying off. Over the years, you can develop a deep understanding of how your brand’s position in the marketplace has changed over time and not only identify areas for ongoing improvement, but areas to celebrate your successes as well. So the next time you’re wondering if you need a survey to help you understand what your customers think of your organization, consider making a long-term commitment to tracking your brand’s performance. 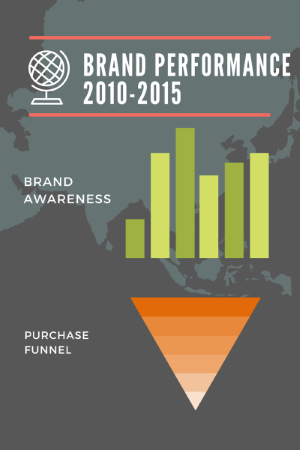 You may be surprised at the power brand tracking can give you while plotting and monitoring future growth. When we think about the pitfalls of conducting market research, our minds tend to focus on all of the mistakes you can make when collecting data or analyzing the results. You can find other posts on this blog, for example, that discuss why it is important to collect data in a way that can be generalized to the entire universe being studied, why intentions do not necessarily translate into actions, and why correlation does not equate to causation. But even if you are diligent about ensuring that your overall methodology is solid, there is another oversight that can potentially cause even more problems in your research: conducting research that isn’t actionable. During my time with a previous employer, we once had an international gear and apparel brand contact us (we’ll call them “Brand X” for confidentiality) that had just completed a large-scale segmentation of their customers through another vendor. While that vendor was qualified to do the work, the segmentation analysis had resulted in 12 market segments. There’s nothing inherently wrong with that from a methodological perspective, but anyone charged with marketing products will agree that it’s incredibly difficult to split your focus so many directions. If they tried to do so, they would likely dilute their overall messaging to the point that it simply wasn’t cohesive. Brand X asked us to try and salvage the project by taking the initial results and refining them into a more manageable set of segments for Brand X in the future. We were able to help, but in the end, the study took roughly 50% more time and resources to complete because they weren’t specific up front about what they were looking to accomplish with the segmentation and the constraints that would need to be in place for it to be usable. At Corona, we are always mindful of this potential blunder, so we encourage our clients to think not only about how to conduct the research, but also why the research is being conducted. We often set 3-5 major goals for the research up front that can be used to vet any other survey questions or focus group topics in order to ensure the end result will meet the needs for which the research was undertaken in the first place. By understanding how you will be able to use the results, you can design research in a way that will ensure the results will allow you to make those tough decisions in the end. 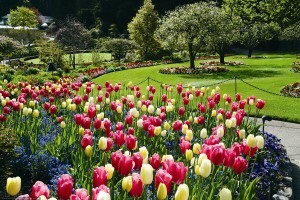 Like many people, I have “seasonal allergies.” March and April bring sneezing fits and foggy brain days for me. Often I get a sore throat and headaches. One year I went through three strep throat tests and a course of antibiotics before my doctor decided my swollen throat was caused by allergies. Knowing you’re allergic to “something” isn’t all that helpful. Sure, you can keep antihistamines on hand and treat the symptoms as they arise, but you have no way to predict when symptoms will hit or minimize your exposure to the allergen. A common first step in identifying the cause is to do a skin allergy test. Typically, this involves getting pricked in the back with approximately 20 solutions containing the most common allergens. The doctor marks off a grid pattern on your skin and each box gets pricked with one item and then you wait and see whether any of the pricked areas swell up or show other signs of allergic reaction. I’ve had this done, but unfortunately (though not uncommonly) I didn’t react to any of the items tested. Which, doesn’t mean you’re not allergic to something, just that you’re not allergic to one of the things tested. Research on myself hadn’t provided any usable information, so recently I turned to external data instead. Where I live, the city provides daily pollen counts for the highest pollen sources from about February through November. They don’t provide aggregated data, however, so I had to build my own database of their daily postings. In the part of town where I live, Ash, Juniper, and Mulberry are the most prevalent allergens during the time when my symptoms are greatest. Ash pollen counts peaked on April 1. Juniper and Cottonwood were also relatively high, but Juniper had been fairly high for weeks without me having corresponding symptoms. Ash was lower overall compared to the previous year, and once again seemed to line up best with my symptoms. This is a correlational analysis, so it doesn’t provide a definitive diagnosis, but because different allergens peak at different times, it offers some ability to rule out other things. And it’s more efficient (and painless!) compared to the skin test. Armed with this information, I did some additional research on the predominant types of Ash trees where I live (Modesto and Green Ash), and the geographic range for those species. If I’m planning to travel to Ash-free zones, I can try to schedule those trips for the spring. And otherwise, I can keep an eye on the pollen counts and try to stay inside with the windows closed when Ash counts are particularly high. It’s not perfect data, but like most tough decisions, we have to do the best we can with limited data and our powers of educated inference. Hopefully less sneezing awaits! Prior blogs I’ve written have established the link between company-level strategic planning, which includes competitive strategy, and marketing organization planning. I’ve also discussed several analytical tools used for competitive strategy, including the SWOT analysis (Strengths-Weaknesses-Opportunities-Threats). I was recently reading through a LinkedIn group’s lively dialogue on the topic of SWOT analysis. One theme that arose is that some in the competitive intelligence (CI) community feel that they may be somewhat unfairly losing out to “information professionals” or vendors who are hired and then apparently proceed to merely populate a SWOT framework with regurgitated, existing data. This is viewed by the CI community as a shortcut to actually using the framework in a more pure or dynamic sense – that is, as a basis for strategic thinking and actual competitive analysis. 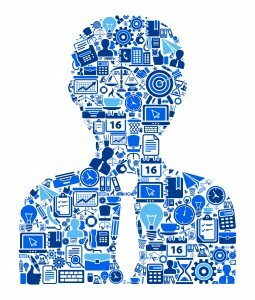 And CI professionals also subtly make the point that the kind of thinking necessary for this analysis is the kind that relies upon experience, knowledge, and training, and is ultimately backed by good old fashioned intellectual horsepower in order to best serve a client in making important decisions. Fair enough. Overall, however, I think a combination of reliable and relevant data that is accurately analyzed and then used by experts and their clients for smart strategic planning and decision making is a great approach. Additionally, I think it’s important to step back and understand where a SWOT analysis lives as part of a larger strategic process. This includes examining what is really necessary for an effective SWOT as well as how a SWOT analysis informs the strategic process going forward. (I’ll explain below in the specific context of a marketing executive’s perspective, but the general principle holds for another line function executive or business manager who may find him/herself undertaking such as process). Once answers to the questions above are clear, then comes an opportunity for smart recommendations and guidance. Logical next steps include: 1) making “invest” or “divest” decisions for a business unit(s) or product area(s); 2) establishing realistic marketing goals for that unit/area; and 3) developing strategies to achieve goals in #2 as it relates to pursuing new and/or existing markets and doing so with either current or new generation products. And this is just the beginning of the fun for a marketing executive. A few articles and blogs I’ve read recently (listed below) discuss the role of a CMO in the context of a larger organization. Accounting practices commonly assign revenues to departments other than Marketing, such as Sales or Operations; thus, sometimes without adequately “compensating” or recognizing Marketing for its role and contributions in branding, customer acquisition, customer retention, etc. Each of these challenges has a financial component or implication, and taken together, they illustrate why a Marketing organization needs to be better aligned with its company’s financial performance. There seems to be no better way to begin to address this than with a CMO’s proactive involvement via a “seat at the table” during a company’s strategic planning and decision making process. I’ve made the case prior how marketing planning and company strategy overlap- it’s at this strategy level in working with C-suite peers that a CMO can seize the opportunity and assume either a lead, co-lead or “expert” role in important data-driven planning steps such as external situation analysis, market opportunity identification, product portfolio investment or divestment decisions, profit and revenue goal setting, and product/market strategies. And market research conducted along the way can certainly be a CMO’s best friend in his/her role as an expert player during this process. 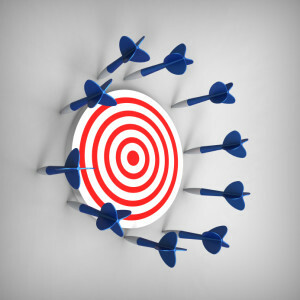 If a CMO is involved at the company’s strategic level, then it naturally follows that s/he should lead the resulting strategic marketing process of segmentation-targeting-positioning which, in turn, results in a selected or fine-tuned market(s) to pursue along with an optimal go-to-market strategy. In sum, if a CMO effectively shepherds and “owns” the entire marketing planning process up to this point, then the case for sharing in revenues will be undeniable and a more direct link to account for return on investment will exist. Another survey finding (below) shows a relatively small proportion of marketers are using, and presumably supplying, c-level executives with the more strategic marketing insights that they desire. This reminds us of both the high need and opportunity to utilize data analytics and market research to provide insights for strategic decisions as well as tactical ones. Recall that, at the end of the day, most CMOs are in alignment with other executives in needing to keep their eye on basic, key metrics such as both profitability and market share by individual business unit. In addition, and perhaps more importantly, CMOs are in charge of the identification and development of product-market strategies to achieve top-level goals. Strategies such as innovation (i.e. new product or service), customer growth (i.e. 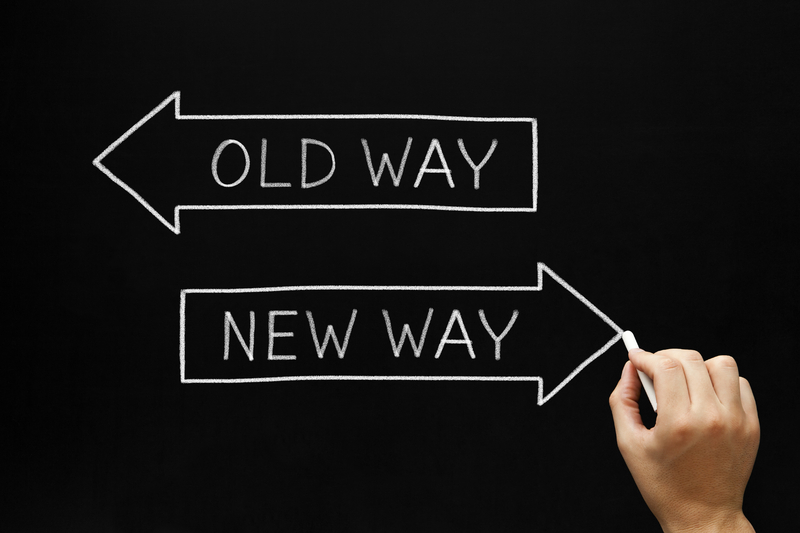 possibly including new markets), customer retention and others all require doing something different than is done today. In order to identify not only what to do, how to do it, but also how it will be measured, market research and data-driven insights will be necessary.